Manchester United, on Wednesday, announced a five year sponsorship agreement with the world’s first halal e-marketplace. 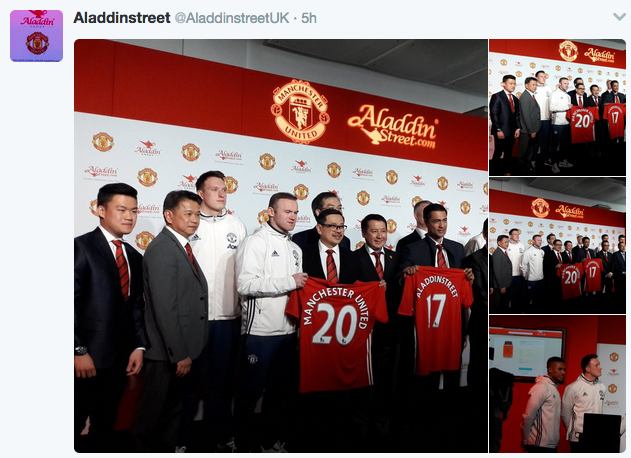 The deal’s launch took place at the Aon Training Complex, Carrington, attended by Aladdin Group founders, Malay dignitaries and team members including, Wayne Rooney. Established less than two years ago, Aladdinstreet.com has already proved itself a commercial force to be reckoned with. The site offers consumers the usual blend of mainstream shopping items, from household to fashion, building materials to pants. It also has a unique selling point: upper end halal cosmetic, food and pharma products. Perhaps surprisingly, it’s four largest markets to date have been non Muslim countries including China and Singapore, where halal products are preferred for their quality, without reference or prejudice to any faith link. The company expects to record a $20m profit this year as it expands into Indonesia, India, the Middle East and Europe. “As a vibrant, up-and-coming young company, Aladdin Street is at the forefront of the industry, providing consumers with the ability to purchase quality, premium and compliant goods from reputable merchants who have been invited to sell on the site. 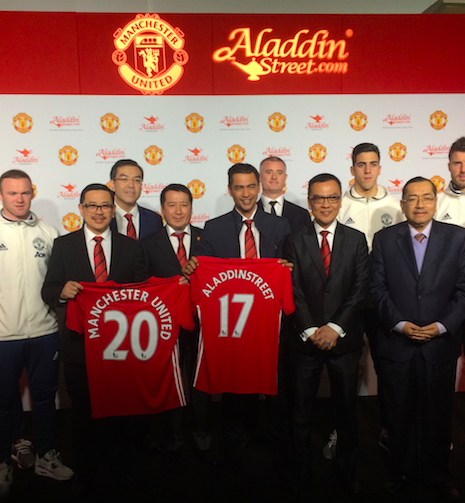 Its partnership with Manchester United demonstrates the company’s dedication to global expansion.” Hill said. Aladdin Group’s Co-founder and President, Dato Sri Desmond To, expressed his delight with the deal. 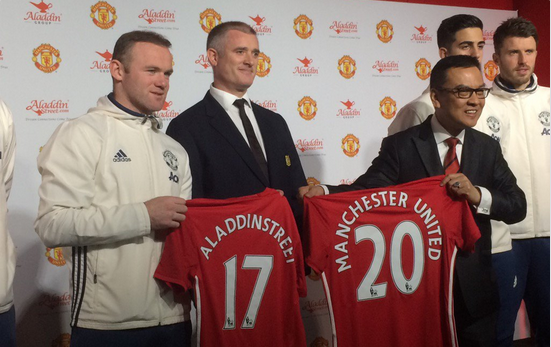 “It is a tremendous honour for the Aladdin Group to partner with Manchester United Football Club. Our goals and ambitions are closely aligned and will soon become visible to everyone in the very near future through our joint campaigns worldwide. The Malaysian based company prides itself on providing customers with authentic halal and ‘Tayibban’ compliant products sourced globally and delivered locally. Unlike other e-marketplaces the site only accepts companies which are registered and certified to international standards and, where relevant, to the specific code of ethics related to the Islamic principle ‘Tayibbun’. Saeeda Ahmed of Education Partnerships UK has been working with Aladdin Group executives for two years on their halal standards and compliance initiative. ‘Tayibbun Islamic values have a natural synergy with British values. They are different from the capitalist model of simply maximising profit. Its about a model of sustainability for the environment and people, looking at a joint model of prosperity.’ She said. Which is where the world’s number one soccer brand comes in. 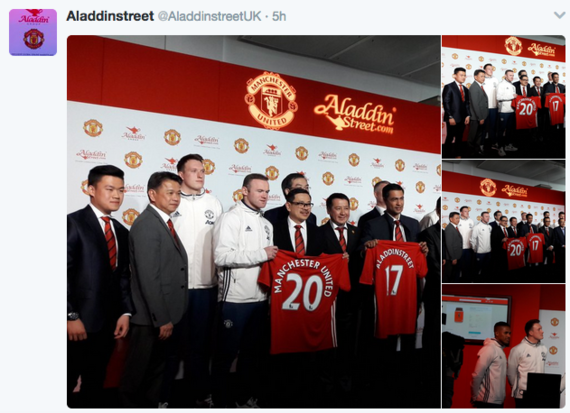 Aladdin Group will work with Manchester United to generate brand awareness connecting with the club’s 659 million global followers, through one to one fan events and worldwide campaigns. A global business friendship based on mutual betterment and an ethical framework. What certain elements in the press make of a business match with positive potential and the word ‘halal’ remains to be seen.